Two months ago, my husband bought our first-ever membership to Costco. I have been trying my best to learn the ropes of warehouse club membership and handle the responsibility with more moderation than I did a few years ago when we belonged to Sam’s. I know that Rule #1 is try to find out when they are giving away free samples and avoid going there during that time. Yes, you can eat a full dinner on samples alone, but you WILL come home with gallons of Acai berry juice, the best chocolate-covered blueberries you ever tasted and a variety of granola bars. STAY AWAY from the samples! I also try to limit myself to trying only ONE new item per shopping trip. I know from experience that if you buy the package of 54 individual vegetable quiches and decide after the first one that you don’t actually like them, you only have two choices. You either have to endure eating the other 53 yourself because no one else in your family will try them. Or you have to keep them in your freezer for an entire year until they have reached their expiration date so you don’t feel as guilty throwing them away. That’s 12.5 pounds of popcorn kernels. Like most families, we have grown accustomed to popping our popcorn in microwaveable bags. 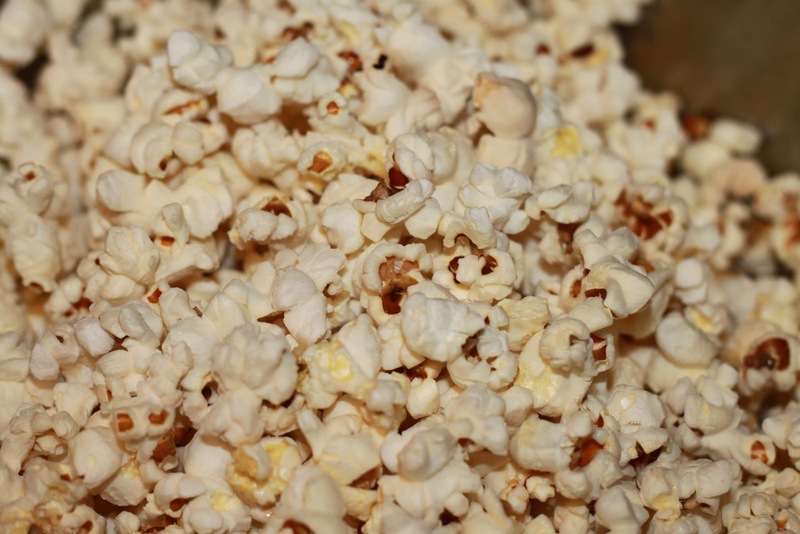 But in the last couple of years, we have experienced on several occasions the amazing freshly-popped popcorn made by some good friends of ours. I would choose the hot-buttered popcorn over dessert any day of the week. I just wasn’t sure if I could see myself getting out a big pan and melting butter every time I wanted some popcorn. I’ve gotten so used to throwing a bag in the microwave and coming back two minutes later when it’s done. I made our first batch about a week ago and we have been eating a steady stream of popcorn ever since. We don’t even bother putting the big pan back in the cabinet. We just keep it out on the stovetop after its washed, ready to be sprinkled with oil and then covered with a thin layer of kernels. Our days of eating bags of popped styrofoam are a distant memory. We have been working on the best combination of oil and butter to make our fresh popcorn. If you add too much oil at the beginning, you can’t add as much butter at the end. But you have to make sure you use enough oil to get it to pop quickly. Our salt consumption also has increased dramatically in the last week or so. The freshly-made popcorn is such a comfort food for me. It reminds me of growing up in southern Illinois when my parents would pop a big batch of popcorn and serve a combination of orange juice and crushed ice they made in the blender. Our whole family would sit down together with our popcorn and orange juice icees for a family game night or Friday night in front of the TV. Some friends reminded me that their moms used to pop their popcorn in bacon grease. I have a feeling my mom would have done the same thing, although it kind of ruins my memory to think about it. 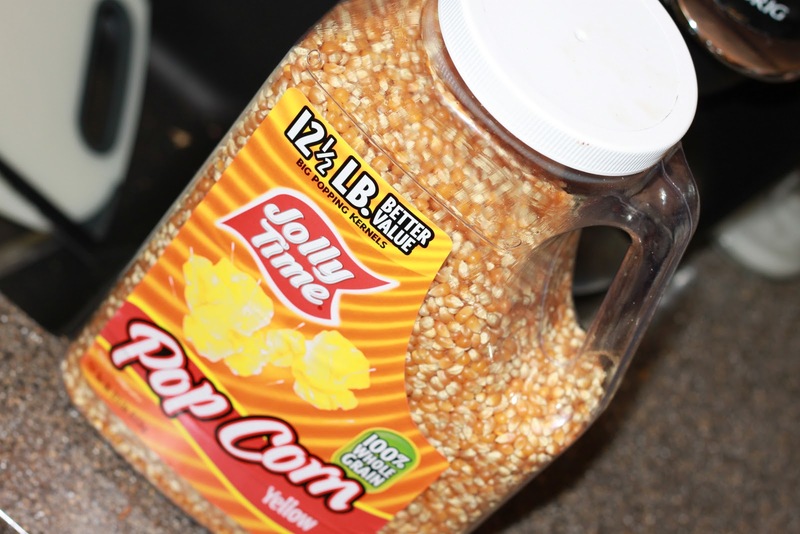 We are quickly making our way through that 12.5-pound jug of popcorn kernels. I’m starting to worry though about how many pounds I am putting on from all of that oil and melted butter! Microwave popcorn will never taste the same again. How about you? Do you ever make your popcorn from scratch? Do you have another snack food that brings back childhood memories? My dad was the plant engineer for a company that bagged Popeye Popcorn so we had popcorn coming out of our ears–and bagged cereals like puffed wheat and puffed rice. We got sick of the cereals pretty quickly and longed for the sweet, colorful kid stuff, but we never got sick of the popcorn. Every Sunday night in lieu of dinner we popped popcorn in a special pan on the stove. I still have memories of eating it every Sunday at 6:00 as we settled in to watch our heart throbs, Shawn Cassidy and Parker Stevenson (aka The Hardy Boys). Oh the memories! Karyn,Thanks so much for sharing your story! That is awesome! I didn't realize your dad was in that type of business… And oh… I do remember the days of Shawn Cassidy and Parker Stevenson! Brenda,Thanks so much for introducing yourself! It's great to meet you. I can't wait to check out your blog!